More news out of Microsoft’s MIX11 developer conference in Las Vegas, with Microsoft showing off its new IE9 web browsing technology for Windows Phone 7. 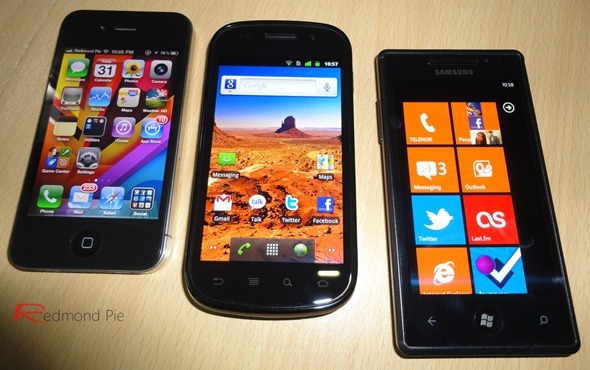 Microsoft today pitted its own mobile browser up against the iPhone 4’s Safari and Google’s Android browser running on a Nexus S, though there was no mention of which versions of their respective software the two challengers were running. All three were put through their paces by Microsoft’s own speed reading test website. The results, unsurprisingly, favored the boys from Redmond. WinRumors managed to capture the fun and games in video, but the gist is this – IE9 smoked both Android and iOS. While Microsoft’s mobile browser (which is basically the desktop app, according to MS) managed to complete the test at an impressive 22 frames per second, Android could only must 11 FPS with iOS languishing in third with just 2 FPS. While these results are impressive for Microsoft, it’s again worth pointing out there was no mention of the software being used on the two competitor handsets. While we’re not suggesting Microsoft’s tests aren’t accurate, it’s something that’s worth bearing in mind when watching the video. With Apple’s iOS 4.3.x bringing improved Java runtime performance amongst other tweaks, it would be interesting to see whether that was the version Microsoft used. Regardless, 22 FPS is an impressive result and Microsoft should be commended for pushing its mobile web browsing team so hard. Interesting days for WP7 ahead!